The Staffroom assessment module is flexible enough to support a variety of different assessment schemes including South African CAPS assessment, Cambridge, and others. 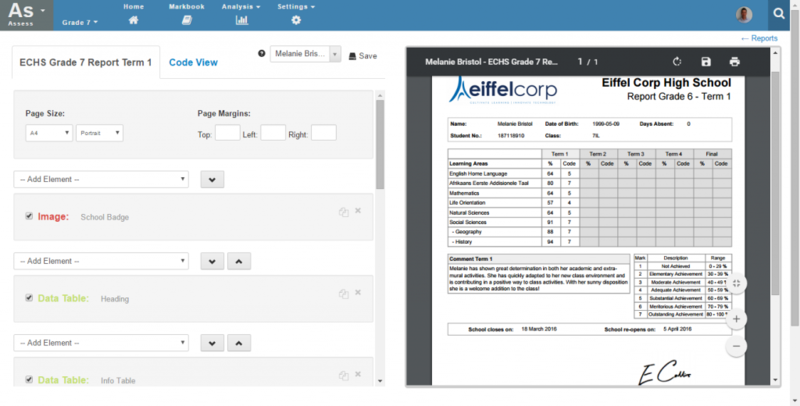 Create markbooks with any combinations of assessment tasks and calculations in them. Staffroom’s term report designer lets you create report designs to suit your school. Display any results from your markbooks along with comments and other student information. Use colours and images, including school logos and even photos of students. Staffroom’s assessment module allows you to display and extract reports in a variety of formats. Using schedules and mark summaries you can aggregate and compare assessment data. Schedules can be created with complex formatting such as government schedule formats.